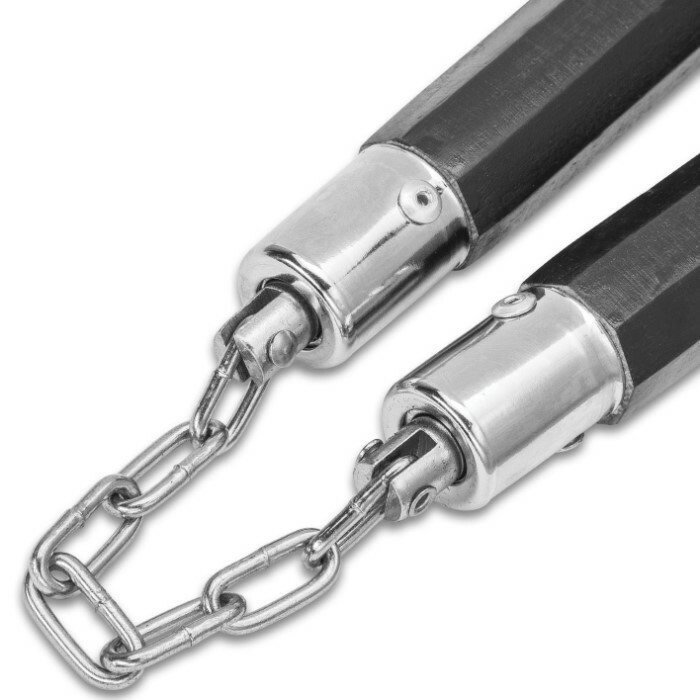 Features include black hardwood handles; 1 1/2" round swivel, and chrome-plated chain link connectors. Not what I expected but are Great! When I received these I was disappointed at first because they are hexagon and the picture showed round nunchaku by United Cutlery but, I see BUDK has changed the picture. After seeing that these are Quality Made and will last along time I went from disappointed to very pleased! Like I said they are quality made and the weight is perfect! I Highly Recommend Them. You might want to order two pair like I did because I am sure these will sell out fast! Thank You BUDK! 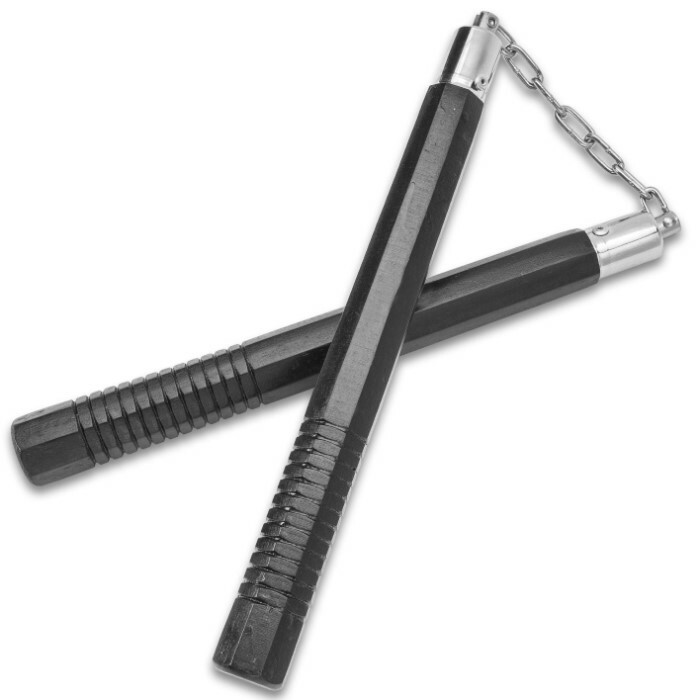 good quality nunchakus, the chain is nice, good for training, also for real combat. Love them excellent for the price. I have 3 other pair and I love these the best. My first pair with chain connection, the other 3 pairs are connected with a string. Love the chain pair the most and I use them more than the others. Ive had and used these for almost 20 years now, bought them when it was still a paper catalog. Glad to see they still are here, I still have mine and now my son is getting some too as he trains now. If you know how to use them, you probably know care and what to watch for, these have held up surprisingly well. Great product. I've had these for several months, and they work great. 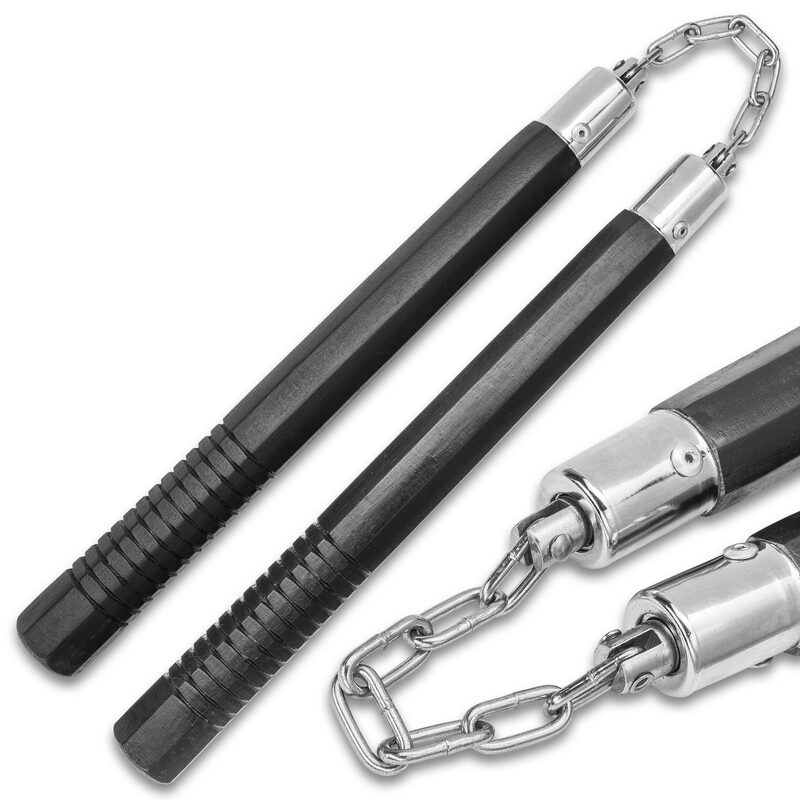 The chain is a bit longer than most nunchucks, which makes it harder to swing, but gives it a longer reach and is awesome for working out. The chain is pretty tough. I've put it through severe stuff, even putting all my weight on the chain, and its still going strong. The only drawback is that since its painted black, it can get chipped really easily. So, if you want this to hang up and look good, get something else. But if you want a good workout weapon for a really low price, this is the thing for you! Got these today and was thrilled, save for two things: They're much heavier than expected. Compared to the other foam nunchaku sold on this site they're considerably slower and hurt more XD. Also, strangely, there are three less grooves on one rod than the other. I got this 2 weeks ago and its awesome, I dropped it like 20 time on the concrete and its fine little scratches but OK. I recommend it.